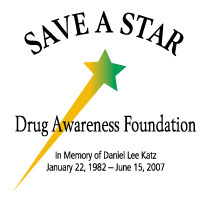 SAVE A STAR Drug Awareness Foundation is a registered 501(C)3 public charity. PAYPAL Account is not required!! Your security & privacy is guaranteed! If you would also like to donate your time and talents, we have many volunteer opportunities. SAVE A STAR Drug Awareness Foundation is a 501(c)3 Public Charity. Your charitable donation is tax deductible to the extent permitted by law. Click here for a copy of our 501(c)3 Letter.